An example of a Native American community working to achieve food sovereignty not only with physical nutrients but also with social elements is the Oneida Tribe of Indians of Wisconsin. 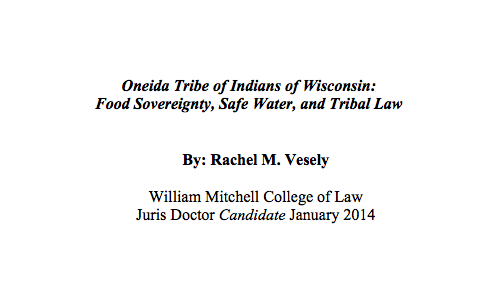 This article analyzes the strengths of the Oneida Tribe's approach to preserving water quality and fishing habitats. Tribal governments face a variety of challenges in developing programs to protect access to healthy food and clean water. However, the Oneida Tribe’s struggles and successes will aid other tribes in creating their own culturally-relevant tribal scheme to improve their food security.